This page identifies the common molluscs found on the New Zealand intertidal rocky shore: octopus, limpets, snails, shells, chitons, nudibranchs and more. Several species can live out of the water for long periods, but most need to be submerged at least most of the time. 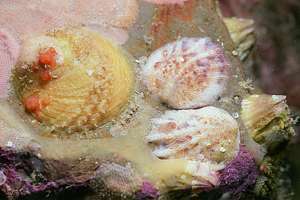 Molluscs are soft-bodied animals but most have a hard shell for protection. 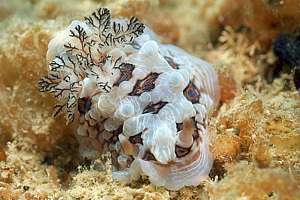 Molluscs come in a vast variety of form, from inkfish (like octopus) and seaslugs to sea snails and clams. Inkfishes are strange molluscs whose foot has split into arms, each stuck with many suckers. Their mantle has become a breathing bag covering their internal gills. 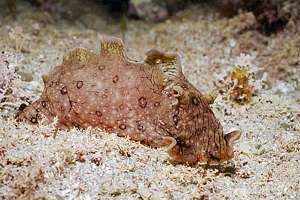 Whereas other animals are designed according to the head-body-legs concept, inkfish are body-head-arms animals. Inkfish are of the crawling type (octopus) or swimming types (cuttlefish , squid and even a swimming octopus). Most amazing is their jet pipe, a loose flap of skin, possibly once part of the mantle, which they use for breathing out of and as a handy tool for digging and also as a jet pipe for swimming. Crawling octopus pull themselves along by their arms, but they can swim quite swiftly using their jet pipe. In rock pools one does not find the swimming varieties of squid and New Zealand has no cuttlefish species. f036900: a small sand octopus (Octopus Gibbsi) [wheke] has taken refuge in a shallow tide pool. Finding an octopus is a real treasure. Often one can see the surface of a rock pool 'breathing' as the octopus exhales through its jet pipe. Octopus feed on crabs and clams. 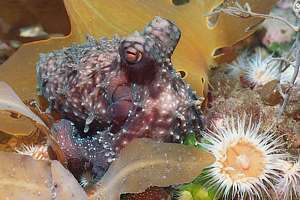 As hungry predators, octopus need much food, reason why they do not stay permanently in rock pools. f035330: The other common octopus is the reef octopus (Octopus cordiformis, Macroctopus maorum) [wheke].The reef octopus does not dig dens in the sand but seeks an existing cavity in the rock, preferably with a very narrow opening through which it slides out of view. 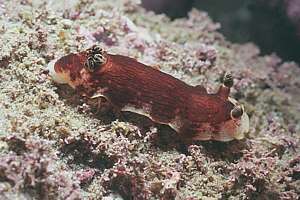 Whereas the sand octopus feeds mainly on molluscs, the reef octopus feeds mainly from crustaceans like crabs and crayfish. The reef octopus is more grey/purple whereas the sand octopus is brown/orange. 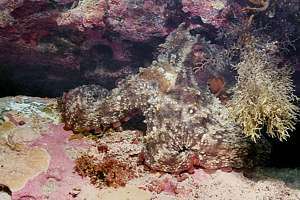 The reef octopus has vanished from many places around the North Island. Sea hares have large flaps covering their backs and gills. They also have large 'ears' for which they are called 'hares'. They also have large mouth flaps with which they can explore a wide swath for edible weeds. Being so vulnerable without a large protective shell, they are nonetheless not predated upon, presumably because they taste foul. 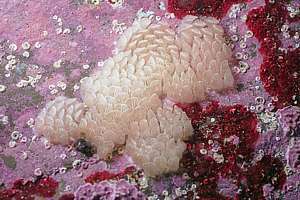 All sea hares are voracious grazers and prolific spawners. Like octopus, sea hares can squirt ink when frightened. 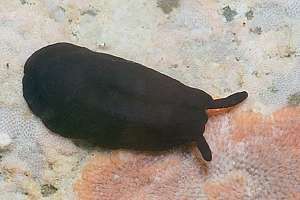 All sea hares carry a remnant of a shell under their folds. By opening the folds gently while sliding one's finger over its skin, one can feel the thin shell. 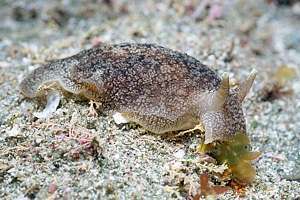 If the sea hare co-operates, it can even be seen. For a parade of NZ sea hares, visit www.seafriends.org.nz/indepth/sea_hares.htm. f050511: the black-tailed sea hare (Aplysia dactylomela) or variable sea hare is brown to greenish with a flower pattern on its skin. When frightened it can squirt a dark purple ink. 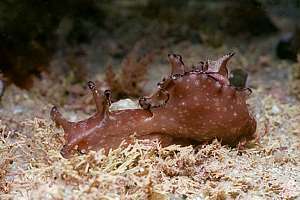 This sea hare lives for only one year but can grow over 1kg large. f050507: closeup of the skin folds of a black-tailed sea hare shows it polka-dotted inside. Also a small 'siphon' is formed in the middle, through which water is exhaled. Note the black tail for which this sea hare is named. 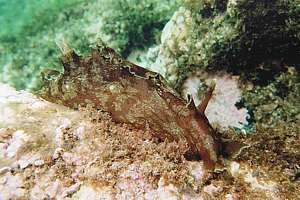 f050421: the little sea hare (Aplysia parvula) is purple-brown with light spots and has a black or checkered margin. 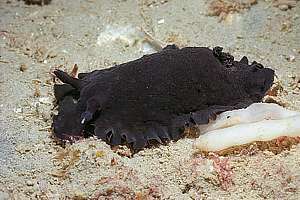 It is much smaller than the black-tailed sea hare. When frightened, it can squirt a light purple ink. f025832: the neatly arranged egg mass of the little sea hare. 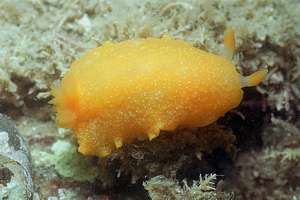 By comparison, that of the black-tailed sea hare is messy and more yellow in colour. f025909: the julian seahare (Aplysia juliana) is not commonly found in the intertidal as it prefers calm water and the food found in sheltered shallows. It can also be smooth brown. It does not slide smoothly but extends and contracts like an inchworm. f035525: the black sea hare (Aplysia brunnea) is found from Wellington south. Although it looks entirely black, its scientific name calls it brown. 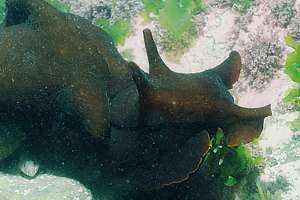 It is a large sea hare, comparable in size to the black-tailed sea hare. f005000: the hairy sea hare (Bursatella leachii) (Bursatella glauca) [rori tararua] lives in calm waters while feeding from detritus. It loves places where raw sewage enters the sea. 0609173: the shield limpet/duck's bill limpet (Scutus breviculus) [rori] may look like a black blob. The mantle over its back can be parted gently to show its large shield-shaped shell. 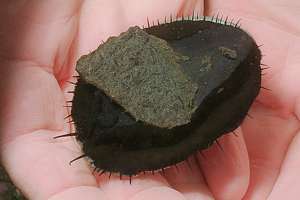 Also called ducksbill limpet because of the shape of its internal shell. f050629: a young shield limpet (Scutus breviculus) under water, sliding over bryozoan mats. 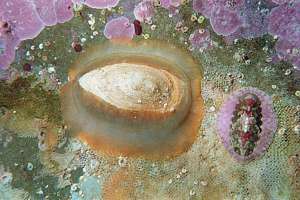 The shield limpet is a detritus feeder and thrives in areas where raw sewage is dumped. 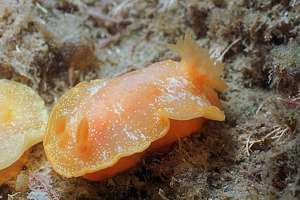 Lamellaria ophione is a flat orange sea snail with a remnant internal shell, feeding on colonial seasquirts. When disturbed, it curls up while producing a lot of sticky slime. f010818: the dark onchidella (Onchidella nigricans) is a secretive slug that comes out of its hiding places to graze detritus from rocks and seaweeds by night. Here it is seen cleaning necklace weed during an early morning low tide. It can be mottled, green, brown or black. It always homes back to its own sleeping spot, deep underneath large boulders. It has a tough skin. f036408: the butterfly chiton (Cryptoconchus porosus) or leatherback chiton is shown here because it can easily be mistaken for a seaslug. 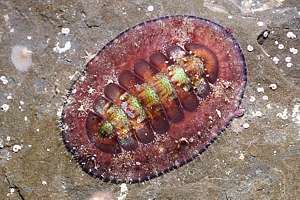 This chiton has its eight hard shells underneath a thick leathery skin. (see lower down the page). The 8 plates of this chiton are narrow, with gaps inbetween. 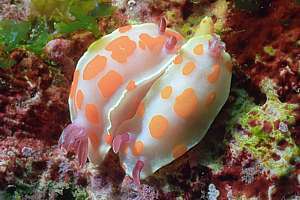 Nudibranchs (naked gills) are the sea slugs of the sea, a crown of evolution. Finding them in rock pools is always exciting. Little is known about them because they do not occur in vast numbers. Most are thought to be specialist feeders, depending on a specialised diet. f050525: the mottled side-gill slug (Pleurobranchaea maculata) has external gills under its righ-hand mantle, here just seen. It feeds on detritus and is often found in degraded habitats. f039700: finely spiralling egg mass of the mottled side-gill slug attached to the inhalant tube of a parchment tubeworm (Chaetopterus variopedata). 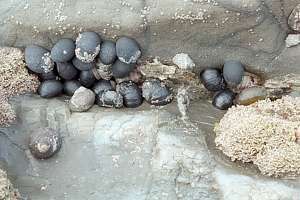 Such an egg mass may contain tens of thousands of eggs. f039702: the black doris (Dendrodoris nigra) is completely black with a thin red margin. f039818: the variable doris (Aphelodoris luctuosa) has many colour variations between white and black, but always has a yellow margin. f050207: the gem doris (Dendrodoris denisoni) (D. gemmacea) is variable in coulour but always has blue spots, black-lined gills and an off-white margin. 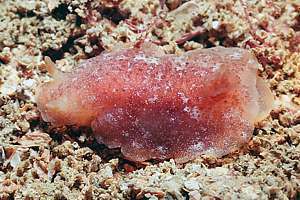 f039736: a brown colour variant of the gem doris (Dendrodoris denisoni). f038822: the gold-lined doris (Chromodoris aureomarginata) is a precious find on the rocky shore. f032722: the clown doris (Ceratosoma amoena) has bright orange spots on white, and purple gills and antennas. Here it is seen mating 'top-to-toe'. f050233: the lemon doris (Dendrodoris citrina) is a yellow doris with a mottled skin. f050228: lemon doris? 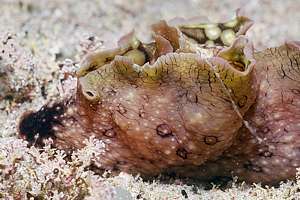 (Dendrodoris citrina ?). Four variants are shown here that all vie for the name lemon doris. 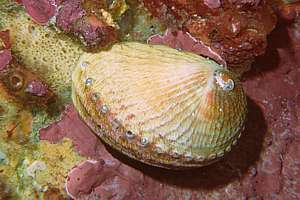 Bivalves have two shells, often almost identical in size and shape. 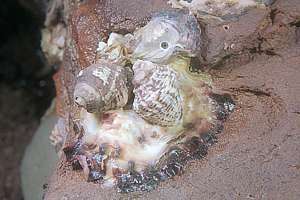 Most bivalves burrow in sand but those that can live on rocks, must be capableof attaching themselves, and in some cases detaching themselves as well, to move somewhere else. Mussels do this by means of byssus threads. The animal's foot which is normally adapted to burrowing in mud or sand, has a groove in which it can secrete a mysterious glue that sets once released. The foot extends very far out from the shell, often at night, to attach the end of the thread to a nearby object. The mussel can release all of its threads instantaneously by discarding the 'knot' where they all join. f019007: small red lamp shells (Waltonia inconspicua, Calloria inconspicua) are not real molluscs but they have two shells and filter the water for food. Brachiopods (arm-foots) have a base shell connected to a short flexible foot. Hinged on the base shell is the top valve and inside is a lophophore, a ciliated filter bracket that sieves the water for food. 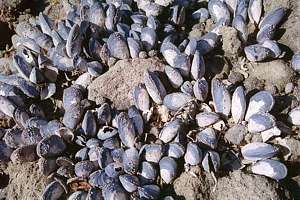 0511068: flea mussels (Xenostrobus pulex, Limnoperna pulex) are very small mussels that form dense patches on the shore, serving as food for many predators like the oyster borer, purple shore crab and sea stars. Flea mussels do not grow larger than 10mm but some reach double that size. They do not live long. f221825: greenlipped mussels (Perna canaliculus) or greenshell mussels are common on the West Coast where they are keenly sought after. On the rocky shore the odd individual can be found and inside marine reserve perhaps banks of these delicious mussels. It needs rich phytoplankton. 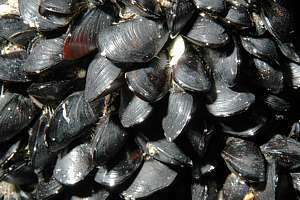 This mussel can become over 10 years old and some 18cm in length. The ones shown here had stunted growth. f980808: the blue mussel (Mytilus edulis, M galloprovincialis) is more common on the South Island. 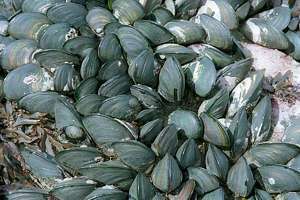 It is a delicious mussel with tender flesh, but does not propagate as well as the greenlipped mussel and does not grow larger than 7cm. It is also easily damaged during harvesting and scrubbing. 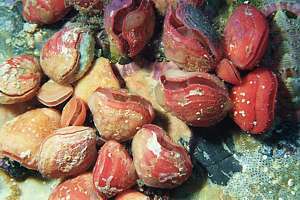 the ribbed mussel (Aulacomya atra maoriana) is a southern species. f050807: the bearded mussel (Modiolus aerolatus) or brown mussel is solitary and often difficult to spot as it allows itself to be grown over by other organisms. f019013: cardita shells (Cardita brookesi) attached to the underside of a rock, by their byssus threads. These shells can crawl and even swim. The red, orange, brown and grey patches are all carpet sponges. the rock borer or piddock (Barnea similis) [patiotio] has thin shells (angels' wings) which do not close at their bottom end. The animal drills holes in the rock by means of acids and sometimes by scraping with its shell. As it begins at a small size, the outward opening of its burrow remains tiny and often not clearly visible. Through this narrow opening, the rock borer extends two thin siphons when the tide is in. Pholadidea suteri is a rock borer with a more rotund shell and flask shaped. They do not gape at their thick ends. 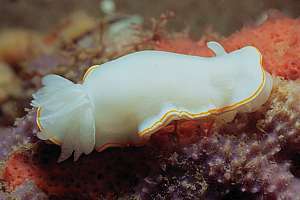 Pholadidea tridens is similar to the above, but smaller. 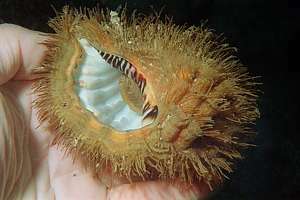 the date mussel (Zelithophaga truncata) [taitaki] is shaped like the pip of a date palm fruit. It drills small holes into rock in which it lives. the Pacific oyster (Saccostrea gigas) grows to 20cm in size and is much larger than the 8cm native oyster. 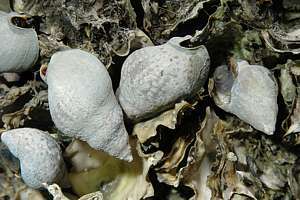 Its top shell is much smaller than its cup-shaped and frilled bottom shell. It is an introduced species preferred for oyster farming, for its size and high growth rate. It was accidentally introduced to NZ in 1960-70 and has since then displaced the native rock oyster. It is thought that the two interbreed. 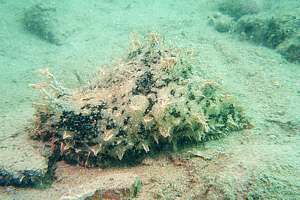 the Bluff oyster (Tiostrea chilensis lutaria) [tio para] or dredge oyster lives on the sea bottom to a depth of 30m, where it can be dredged commercially. 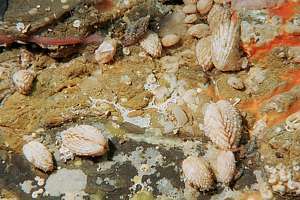 It is mainly found in Foveaux Strait near Bluff. f050535: little fan shell (Chlamys zelandia) [kopakopa] is attached to the rock by means of byssus threads like mussels do. 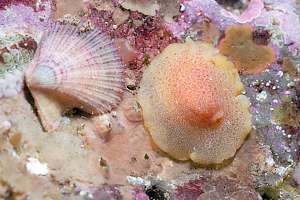 On right a lemon doris nudibranch. 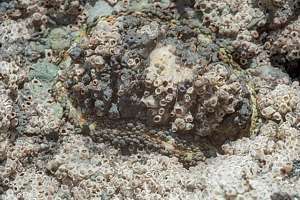 The brown patches are encrusting sponges. f215206: large oyster borers (Lepsiella scobina) on a native rock oyster (Sacostrea cucullata, S. glomerata) [tio], while attempting to drill holes. The small oyster above has already been drilled into, as the small conical hole shows. 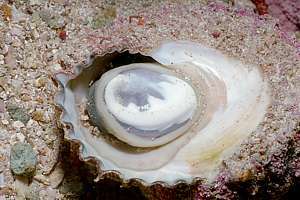 The top half of the native oyster is almost the same size as its bottom half, and is usually convex. Oysters are bivalves that have lost their foot as they are cemented by their left shell to the rock. 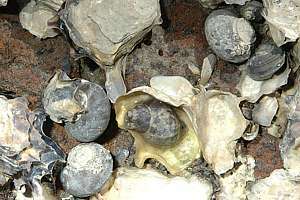 The rock oyster is limited to the North Island. Univalves have only one shell which gives them a very flat profile and a very big foot for attachment. This shape can survive the most turbulent of water. NZ has three species of abalone (paua, earshell) and all three are very strong. 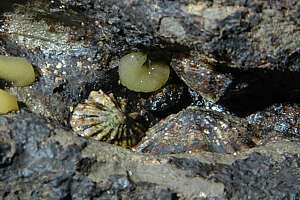 Limpets are also strongly attached to the rock, especially to their homing patch where they sleep and wait for the tide to return. f036111: the rainbow or blackfoot paua (Haliotis iris) is the largest abalone, growing to 25cm in the cold waters of the South Island. In warmer waters it does not grow well. The paua photographed here sits on its homing spot. Notice how its surroundings, including the hard pink paint have been grazed smooth. The outside of this animal has been ground down and polished by pebbles. Paua are voracious grazers, capable of scraping the hard pink paint, the calcium of which they perhaps use to build their shells with. Inside is rich iridescent blue/green. f032402: a paua's grip on the rock is so strong that it is almost impossible to remove it without damaging it. This paua came off because the rock gave way. Paua have short tentacles all around their bodies. When exploring and feeding, they extend a large mouth flap like sea hares do. Paua are very strong grazers, not only eating the fine hairy algae but also small macro algae like stalked kelp. When attacked by a sea star, they flick their bodies around, forcefully and literally run away at speed. f027220: the yellowfoot paua (Haliotis australis) [hihiwa karariwha] (85mm) or silver paua sleeps by day and forages by night. It is perhaps the fastest running mollusc known, capable of 'running' over the tops of waving seaweeds. It also navigates with excellence back to its homing spot in a crevice. f019035: the virgin paua or white foot paua (Haliotis virginia) [marapeka] (50mm) is the smallest of the three, its outside often red and inside bright silver. It is a shy animal, hiding under rocks by day and foraging only by night. Here it is seen on a bryozoan mat next to two lamp shells. f009517: the radiate limpet (Cellana radians) [ngakihi] can have many patterns but it is always a smooth, flat limpet with some radial patterns and its top highly off-centre. 0608229: radiate limpet (Cellana radians) has many forms. striated limpet (Cellana strigilis redimiculum) (80mm) is a large limpet with 20 strongly sculptured radiating ribs with weaker ribs in between. Most abundant in Otago and further south. 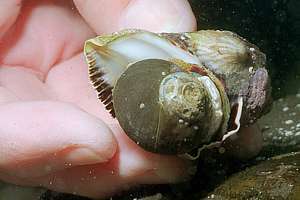 the golden limpet (Cellana flava) grows to 5 cm in size, a large limpet. It is found between East Cape and Kaikoura. Cook Strait limpet (Cellana denticulata) is also a 5cm large limpet with a round 25 toothed ribs. the star limpet (Cellana stellifera) is as large as the radiate limpet but less common, and prefers open coasts. 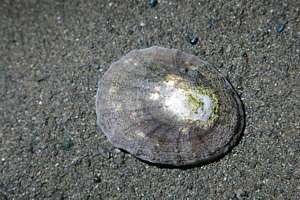 the fragile limpet (Atalacmea fragilis) [tupere] is a 5-15mm limpet, found under boulders. Emerald green with concentric lines. Notoacmea daedala is a very small 15mm oval dark brown limpet with pale yellow-white patterns on a thin shell. 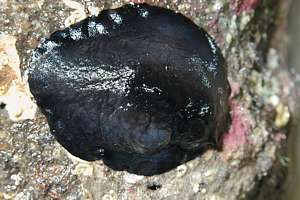 the black-edged limpet (Notoacmea pileopsis) [ngakihi po] lives on exposed rocks towards high tide. It is mottled greyish-green on the back and bluish-white inside with a black border and a brownish central area. 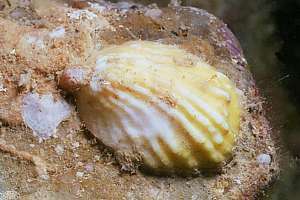 Patella corticata (30mm) has a thick ribbed shell and a head with two white tentacles. 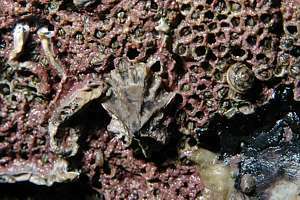 the encrusted or camouflage limpet (Patelloida corticata) [ruharu] is a small flat limpet, star shaped and found at the bottom of the sublittoral fringe. Because it is overgrown, it is well camouflaged. Siphonaria zelandica, Siphonaria australis? [ngakihi awaawa] is a siphon shell (pulmonate limpet) with about 16 radial ribs, looking very much like a young radial limpet or ornate limpet. It is found mainly under water in a sheltered place. Benhamina obliquata (65mm) is the larges pulmonate limpet with circular ridges and slight radial ribbing. Irregular oblong dark shape with a lighter margin. 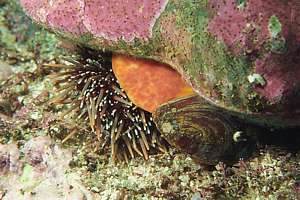 the slit limpet (Emarginula striatula) [ngakihi hahae] has a slit in front. the key-hole limpet (Monodilepas monilifera) [ngakihikihi] has a hole in the top (apex) of its shell. 0608234: a siphonaria zelandica/S. australis looking like an ornate limpet (Cellana ornata) but the two spawn capsules above give it away. f018928: grooved limpet (Tugali elegans) [ngakihi] can cover its shell almost completely with its mantle. f051608: circular slipper limpet (Sigapatella novaezelandiae) [ngakihi kopio] and ribbed slipper limpet (Maoricrypta costata), both native. f051617: ribbed slipper limpet (Crepidula costata, Maoricrypta costata). [ngakihi hiwihiwi] Native. Note the small male on its back towards the top left. 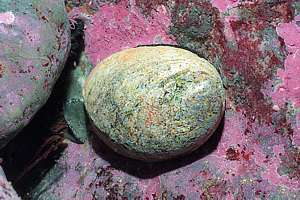 Eggs are brooded under the female's shell. 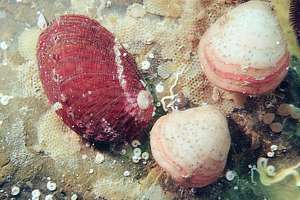 the smooth slipper limpet (Maoricrypta monoxyla, Crepidula monoxyla) [ngakihi tea] is almost always attached to a host shell such as the greenlipped mussel and large cats eyes. 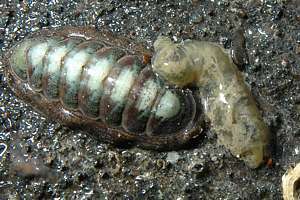 Chitons have eight shell parts (valves), hinged together and surrounded by a flexible girdle. They are extremely hardy and able to lay flat in any contour of the rock, thus minimising their exposure to waves. They stick so well to the rock that one would not be able to dislodge them without damaging them. 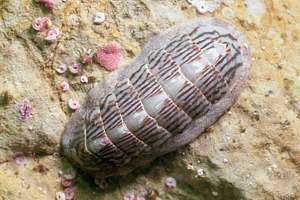 Chitons are also called coat-of-mail shells resembling the overlapping plates of body armour on medieval knights. 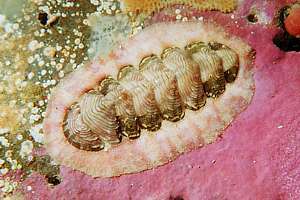 Most chitons have numerous tiny holes through their valves (shell plates). Through these holes they may extend fine tentacles that can be withdrawn. These tiny tentacles are sensitive to light. 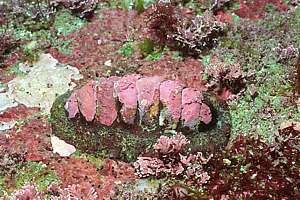 0609160: the noble chiton (Eudoxochiton nobilis) has a smooth red ro green girdle. Their foot is always orange underneath. The transparent worm is a ragworm or bristleworm (Flabelligera affinis). f034116: a large giant chiton (Plaxiphora obtecta) (Guildingia obtecta) in deeper water is encrusted by pink paint. It has a scruffy hairy girdle and can grow to 9cm long. 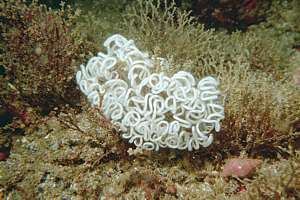 It is found in the photic (light) zone from mid tide to about 15m depth. 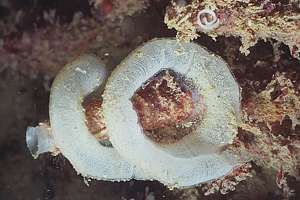 When not encrusted it has smooth dark green valves with a pale stripe down the crest. f009518: the snakeskin chiton (Sypharochiton pelliserpentis) [papatua] is found mainly in the intertidal. Its skirt looks like a snake's skin, with scales. Here it lives amongst the sheet barnacles which also grow on top of it. 050610: the blue-green chiton (Amaurochiton glaucus) can be blue to green with many different patterns. it is a beautifully marked chiton. It hides underneath stones by day, to come out only at night. f019001: the large chiton is the violet chiton Notoplax violacea. 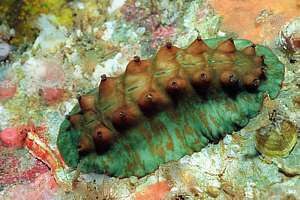 The green chiton with the white crest is the maori chiton Ischnochiton maorianus. At the top the tree-ring chiton and an unidentified orange chiton or limpet. f018924: the tree-ring or etched chiton (Onithochiton neglectus) has variable colours from a pink girdle and yellow valves to a purplish girdle with green valves. Its valves have a tree ring growth pattern. Onithochiton neglectus neglectus has 8 slits in its head valve. 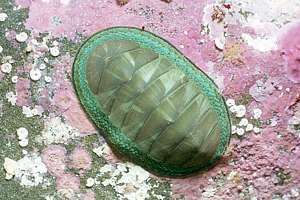 Onithochiton neglectus subantarcticus is found in the southern South Island, Auckland- Antipodes- and Chatham-islands. 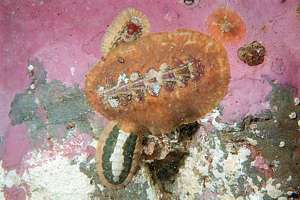 It has a large pink girdle and green striped valves. Plaxiphora caelata (Maorichiton caelatus) is greyish brown with ribbed valves and a greyish brown girdle with several tufts of spicules. 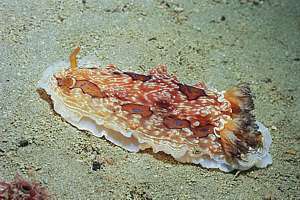 Plaxiphora obtecta (Guildingia obtecta) is a large chiton (up to 90mm) with a wide, fleshy, hairy girdle. It has narrow, smooth olive valves with a broad pale stripe running through the middle. 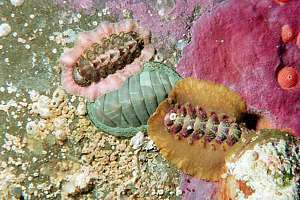 Acanthochitona zelandica is a medium sized chiton whose girdle bears 18 tufts of long bristles. Its head valve has 5 slits. Olive to green/brown. f051632: the maori chiton (Ischnochiton maorianus) is light coloured with many colour variations and even stripes as shown here. It has a light coloured margin. f018917: a variety of chitons. From left to right: the tree ring chiton, green chiton, violet chiton and a radiate limpet. 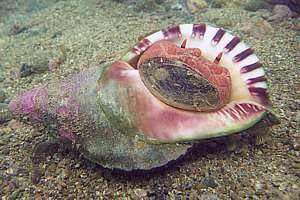 Most snails have coiled shells that consist of two parts: the shell proper and the closing disc (operculum), but some snails have lost their operculums (cowries, bubble shells). This shape has been most successful in nature as it provides for permanent protection and adequate mobility. Grazing snails can be recognised from their rounded shells and rounded openings. The rounded foot of grazing snails allows them to move from side to side while scraping algae from the substrate by means of their rasp-tongue (radula). 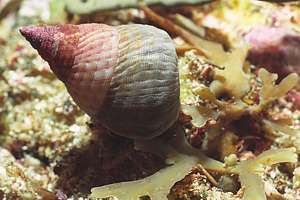 Predating and scavenging snails are all whelks, characterised by an oval opening. 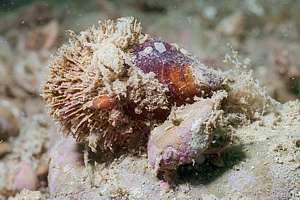 Whelks have feet designed for 'running', to catch up with evading prey and to be the first at a dead organism. 0609133: the blue-banded periwinkle (Austrolittorina antipodum) [ngaeti] is a very small snail with a thin shell, capable of living out of the water for months. It grows slowly and lives for many years. Here it is seen in a spawning aggregation on a sheltered high of the reef. 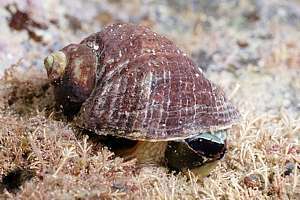 A larger species brown with a lined shell (Austrolittorina cincta) is found on the West Coast and the South Island. When fully retracted, the periwinkle hangs on by a dried glue of mucus. f009535: black nerita (Nerita atramentosa) [matangarahu] is well adapted to living out of water for prolonged times. It is the 'crash helmet' of the shore, extremely hardy and able to survive the worst of wavewash. In the picture also small grooved topshells Melagraphia. 0608231: the grooved topshell (Melagraphia aethiops, Diloma aethiops) [maihi] is found mainly in mid-tide, living where it is half exposed and half submerged. It is easily recognised from its off-blak brown colour and grooves. Perfect shells also show an intricately engraved pattern, particularly around the mouth where new shell is formed. 0612056: the catseye snail (Turbo smaragdus, Lunella smaragdus) [ataata] has a green-white closing disc, resembling a cat's eye. It has a smooth, rounded shell, except when young when it has parallel grooves, see top right corner. 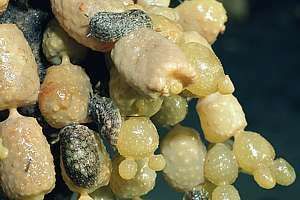 When smaller still, its shell has nodules. 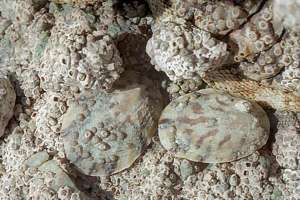 The white shells are those of the rock oyster (Sacostrea cucullata). In the centre a small Cominella maculosa. brown-lined periwinkle (Austrolittorina cincta) is found in the South Island, also beyond the high tide mark, and in places the two small periwinkles are found next to one another. Diloma bicanaliculata lenior has a knobbed or ridged spiral pattern around the shell and looks grainy. East coast South Island. Diloma nigerrima (26mm) is a smooth very dark bluish-grey shell, often found grazing on bull kelp. Diloma subrostrata [whetiko] is found on sand flats, the mudflat topshell. 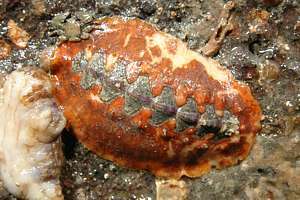 Diloma coracina (12mm) has a smooth shell with weak spiral grooves, brownish or orange in colour and overlaid with a netted pattern. Mostly found amongst mussels. Diloma arida (20mm) is almost identical in shape to D nigerrima. shell black with white specks and aperture interior iridescent reddish. Found among boulders in the high intertidal. Diloma zealandica has definite spiral ridges and a raised white ridge back from the outer lip. Shell black with faint yellowish dots. Risellopsis varia (5mm) is a flat top shell with 5-6 ridges, speckled yellow-brown with dark red lines. the mud whelk Cominella glandiformis (25mm) is found mainly on mud and sand flats where it burrows until food becomes available. Its whorl has longitudinal knobs and it is variable in shape. the spotted whelk Cominella maculosa (50mm) has a smooth greenish-grey whorl with spots, and a wide aperture. Found in sheltered places along the North Island. f036235: the Cooks turban shell (Cookia sulcata) [karaka] is the largest grazer on the reef, with a very heavy shell. It does not like to be out of the water but can sometines be found in a rock pool. 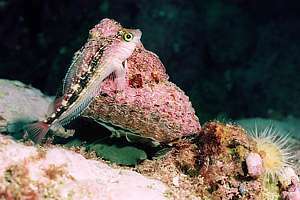 Here it is showing its foot and snout, and a variable triplefin is resting on its back. f049627: the Cooks turban snail also has a thick closing disc, which makes it almost impregnable. Yet spotties know how to flip it over, waiting for the shell to expose it soft tissues. f040336: the opal top shell (Cantharidus opalus) [matangongo] (up to 40mm) is a very beautiful shell with gradients of colour from red to blue to green. It normally feeds on kelp but can be found in rockpools. Here it is feeding on a young flexible weed (Carpophyllum flexuosum). f051620: purple top shell (Cantharidus purpureus). (20-30mm), has weak spiral ribs and can vary in colour from purplish green to bright red. 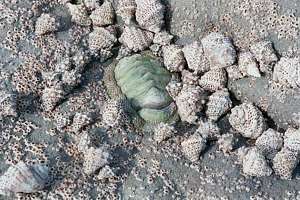 Thoristella oppressa, a small mottled green top shell that grazes the fronds of large brown seaweeds like the flapjack. Micrelenchus dilatatus, [matamatangongo] a small top shell found grazing on seaweeds. It has very fine lines on a brown background and looks like plastic. Cantharidella tesselata, a tiny top shell (2-5mm) with fine interrupted lines, greenish. 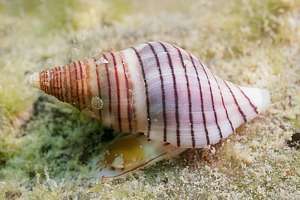 the tiara topshell (Trochus tiaratus) is variable in colour, often cream, with fine red-brown markings and tiny brown dots on the spiral lines of the base. f051614: the green top shell (Trochus viridus) [tihipu] is normally found subtidally but may survive in stable rock pools. 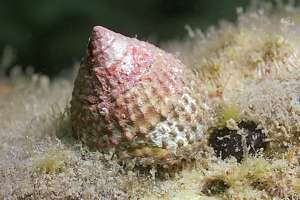 f009603: the oyster borer (Haustrum scobina) (Lepsiella scobina) [kai kai tio] is a small whelk with a grooved and ribbed spotted shell. It is named after its European lookalike which specialises in drilling holes in oyster shells. 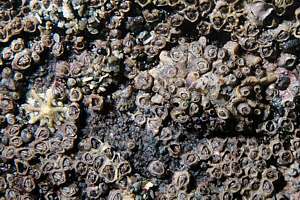 The NZ oyster borer is smaller and lives mainly from sheet barnacles and flea mussels. f050400: the dark rock whelk (Haustrum haustorium) [ngaeo] lives mainly under water where it predates on any grazing snail. Here it has just caught a catseye snail and is turning it over to allow its radula to drill into its prey. It has a very large aperture. 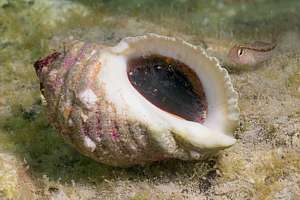 f032406: a dark rock whelk has captured a catseye snail and has rotated it face-on. Now it drills into the snail's tissues while slurping the 'soup' through its siphon. The snail is fully covered to prevent spills that could attract other predators or scavengers. 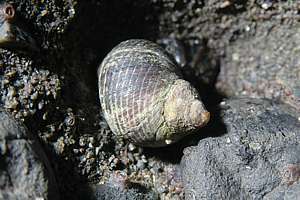 Note the white slipper limpet (Maoricrypta monoxyla) on its side, with 3 growth rings. f051604: the white rock whelk (Dicathais orbita) [hopetea] competes with the dark rock whelk for the same kind of food in the same habitat. 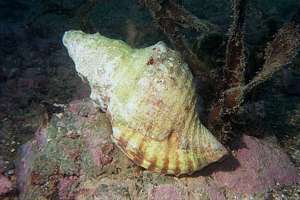 This whelk also predates on mussels. f051408: Haustrum lacunosis (Lepsithais lacunosus) (50mm) is a large white whelk, similar to Dicathais orbita but has deep grooves with growth lines and a frilled aperture. Found from Cook Strait south. Paratrophon patens (25mm) looks like a small white rock whelk but has a dark purple aperture. West coast of the South Island. 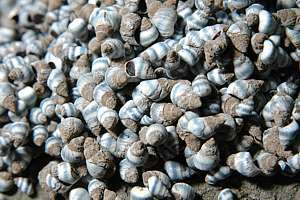 the brown horn shell (Zeacumantus subcarinatus) [huamutu] is a tiny tall-spired dark brown top shell (13mm), found mainly inside estuaries. f018905: the monoplex whelk (Monoplex australasiae) has a beautiful opening and is unusually haired on an external skin (periostracum). 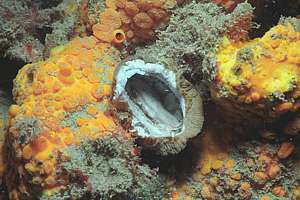 It normally lives well below tide but may occasionally be found in a deep rock pool f039701: monoplex whelks lay their eggs inside a solid egg capsule, which once the eggs have hatched, remains a mysterious object for a long time. The yellow sponge is the boring sponge Clione cellata. f011619: the triton whelk (Charonia capax) is the largest whelk of the shore. It predates on starfish and sea urchins but does not like to be out of the water. Although its outer shell is often worn, its opening is smoth and beautifuly coloured. The animal itself is red. f018903: a trumpet whelk devouring a sea urchin. It also eats the test and spines to help make its massive shell. Note the little holes in the shell, drilled by tiny burrowing worms. f018404: the red trumpet whelk (Charonia rubicunda) has a lighter shell with brown lines. It is also smaller. 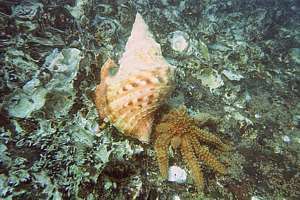 f017234: a red trumpet whelk at the moment of pinning down an eleven-armed prickly star. The star escapes by sacrificing an arm. Note that one of its arms has already been eaten and is now regrowing. The whole arm is ground down and eaten. 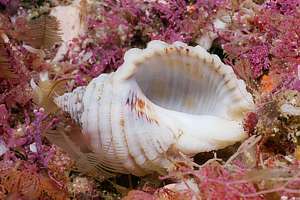 siphon whelks (Penion spp.) can also be found in sandy patches in the intertidal. Waterhouse's trumpet (Cabestana waterhousei), although rare in the shallows, can also be found. 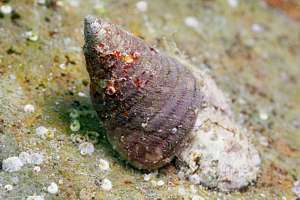 0612054: the spotted cominella whelk (Cominella maculosa) (5cm) is more common in muddy habitats, but may occasionally be found on the rocky shore, particularly on the West Coast. 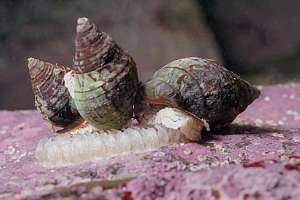 f050418: the red-mouthed scavenging whelk (Cominella virgata) seen laying eggs in a three-some. Most snails are hermaphrodites, being both male and female in one animal. By laying eggs together, they can be fertilised by the others. f051603: the lined whelk (Buccinulum lineum) is found mainly below low tide or in stable rock pools. f050419: egg capsules of the red-mouthed scavenging whelk, closely spaced together underneath a large stone.